Ashe Theme documentation - Designed & created by WP-Royal. All Right Reserved. At first thanks for the interest! With this powerful WordPress theme, you can build Personal or Multi-Author blog websites. It is very easy to use and user friendly. With the WordPress Live Theme Customizer - a real-time Theme Options panel you can create your own, unique design. Multiple Blog page variations with cutting-edge Featured Posts Slider, Promo Boxes, Instagram Footer Area and many more are guaranteed to WoW and Inspire! Click on Activate (view screenshot). You are done! If you prefer a Video Guide, please watch this tutorial. 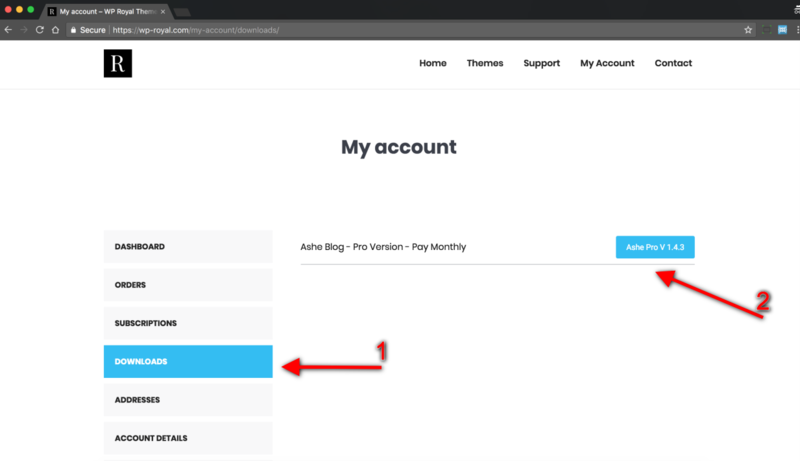 Important Notice: The installation instructions of the Ashe Pro theme has been changed after 8 March 2018 GMT 6:00 PM, so if you have purchased the theme before this date, please Click Here to change the theme installation steps below. 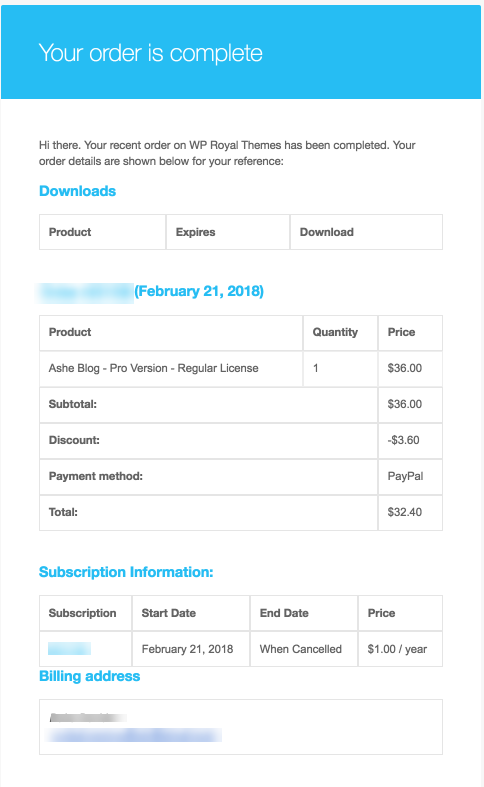 After the theme purchase, you've received an email with a direct theme download link and the unique license key. 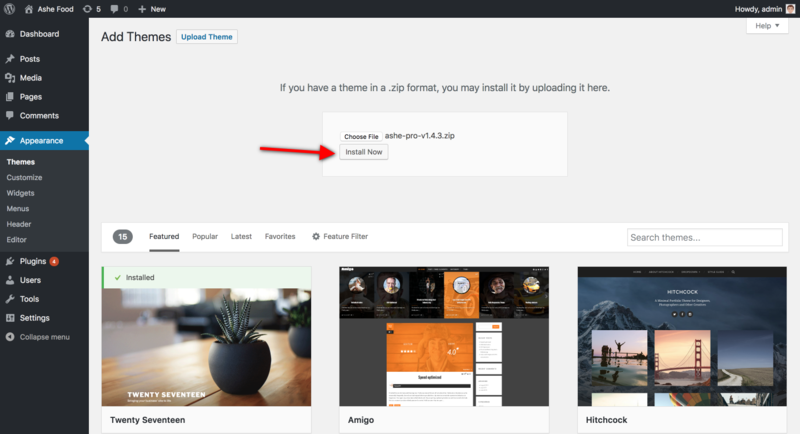 To get started, you need to download the theme first. Please watch this Video Guide to download the theme correctly. Note: if you are a Mac Safari user, please watch this Video Guide. If you are a Mac user and running Safari browser you need to disable auto open of .zip files feautre from browser settings in order to download the Ashe theme .zip file properly. This video tutorial will guide you through the process. This is a very common issue for Mac users and could be fixed very easily. 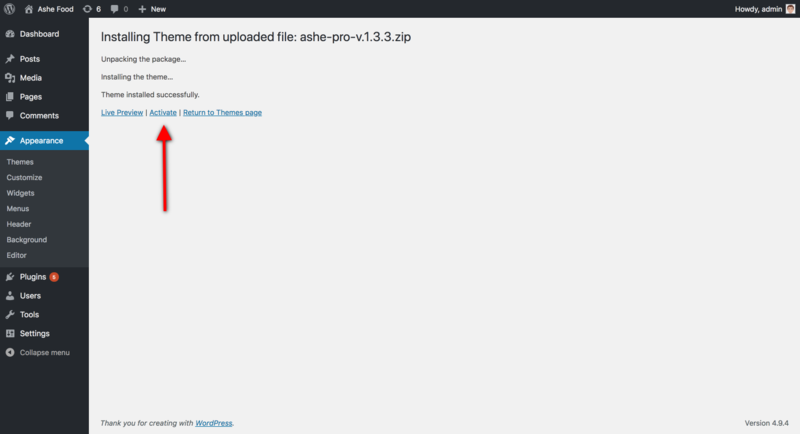 Now you'll see Ashe Pro theme in your themes list. own Username and Password (received via email within checkout). Note: if you have not received that email, please check in Spam, otherwise contact us and we will help you with this. If you are a Wordpress beginner it's highly recomended to install the Demo Content, which will give you a basic content setup similar to our demo website. Navigate to Appearance > About Ashe and follow the instructions or watch this Video Tutorial. This information covers only Ashe Pro theme features. Navigate to Dashboard > Appearance > Ashe Options, click on Import Demo Content button and wait until it ends. Note that import time depends on your internet connection and server config. 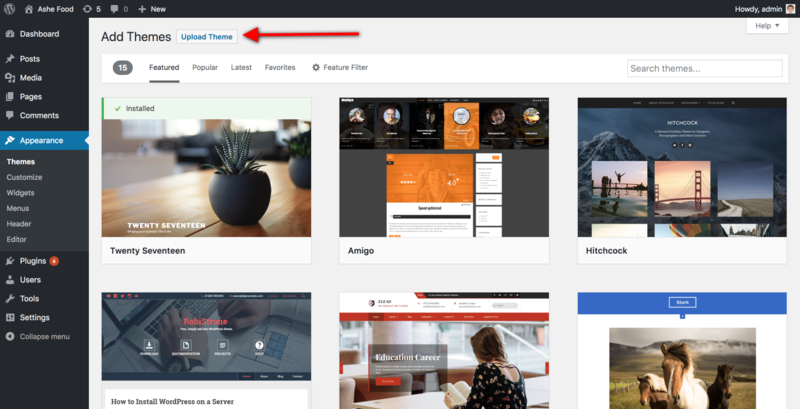 If you are not a Wordpress beginner and you've just skipped the demo content setup you should get the basic idea how this theme works. Theme supports 2 menus on 2 different locations: Top Menu and Main Menu, they both support multi level sub menus. Top Menu is located in the Top Bar (the very top of your website). Navigate to Appearance > Menus, create a new menu, add menu items and set Display Location to "Top Menu" then click on Save Menu button. Main Menu is located under the Page Header(logo section) and this is a main navigation of your website. To setup Main Menu navigate to Appearance > Menus, create a new menu, add menu items and set Display Location to "Main Menu" then click on Save Menu button. To set up a Logo navigate to Appearance > Customize > Site Identity > Logo Setup. Select an Image from Media Library or upload a new one. Width option should be the same as your logo image width(x) dimension is. To setup a Retina logo, you need to upload 2x bigger image than the Width option is set, for ex: if the Logo image width(x dimension) is 400px, then you should set Width option to 200px. Also, you can Show/Hide Tagline under the Logo image. Use Display Site Title and Tagline checkbox for that. Actually, the Header Image is a Logo background area, you can set a background image from Appearance > Customize > Header Image > Page Header (tab). To set up a full screen image, you should set Background Image Size to Cover, but if you want the header image to be repeated - set to Pattern. Please note: This information only covers Ashe Pro theme features. You can adjust the Page Header Height and Logo Top Distance (Customize > Site Identity > Logo Setup) in pixels. With these options you can get a multiple variations of the Page Header design. Also, you can enable Parallax Scrolling, which will give a stunning effect to your header image. To set up Social Media Icons navigate to Appearance > Customize > Social Media, first select the icon, then enter your social media URL. These icons will appear in the Top Bar (the very top of your website). You can disable Top Menu and Social Icons globally form Appearance > Customize > Top Bar. You can set up to 8 Social Icons and display them on 3 different locations: Top Bar (Customize > Top Bar), Main Navigation (Customize > Main Navigation) and Page Footer (Customize > Page Footer). Also Top Bar has an Arrangement and Background Transparency options, which creates a completely different feelings in your website design. You can add your own Copyright information from Appearance > Customize > Page Footer, but the theme and author credits are unchangeable in the Free version. Thre are NO "theme and author credits" in the footer! Also, you can enable/disable Social media Icons. In the featured area you can display Featured Slider and Feautred Links(promo boxes). Enable Featured Slider from Appearance > Customize > Featured Slider. You can dislpay randomized All Posts or posts by Category in the slider. Also you can set the Number of Slides, which will limit the posts in the slider. Please note that the post which does NOT have set the Featured Image will NOT appear in the slider. You can set specific posts by post options metabox to be displayed in the Featured Slider. Edit the Post, scroll down to the Post Options and set Show in Featured Slider option to "Yes" to display the current post in the slider. Navigate to Appearance > Customize > Featured Slider and set Display Posts option to "by Post Options - Metabox". Also you can sort them by Date, Number of comments or just Randomize. You can choose from different Slider layouts, columns could be changed from 1 up to 4. You may enable/disable Slider Arrows, Pagination and other elements as well. Featured Links or Promo Boxes will showcase your custom links or links to pages on your website. Go to Appearance > Customize > Featured Links and enable them via global checkbox. Then you should set a Title, URL and an Image, but note that without images they won't work properly. You can set up to 5 Featured Links, stretch them to fill the content width and enable/disable gutter. <!--more--> tag. You can Change Post Pagination type from Default to Numeric as well. Related Posts could be disabled by setting Related Posts - Display options to None value. You can control Horizontal and Vertical gutters of your Blog Grid, set Post Excerpt Length, change Read More button text, disable/enable all elements, choose from 4 pagination types: Default, Numeric, Infinite Scroll, Load More Button. Pro version has inbuilt Post Sharing which could be enabled from the Blog Page section. You can change Blog Grid Layout from Customize > General Layouts > Page Layouts(tab) > Blog Page. Theme supports 4 widgetized areas. Just add widgets in them and they will show up. Empty sidebars are hidden by default. Sidebar Left widgets will be displayed on the left side of your Blog Feed and the Sidebar Right to the right side. Footer Widgets will be displayed after your Blog Feed. Sidebar Alt is and additional sidebar which is hidden by default and slides from left to right when the Sidebar Alt Icon is triggered. This icon is located on the left side of the Main Menu in the Main Navigation section. Icon can be disabled form Cusotmze > Main Navigation Section. There is additional Instagram Widget area which is displayed in the Page Footer, above your copyright information. To setup instagram on your website you need to install/activate Instagram Slider Widget or WP Instagram Widget plugin from Plugins > Add New, after you activate one of these plugins, related Instagram Widget will appear in your widgets list(Appearance > Widgets), then just drag it to Instagram Widget area and enter your credentials. 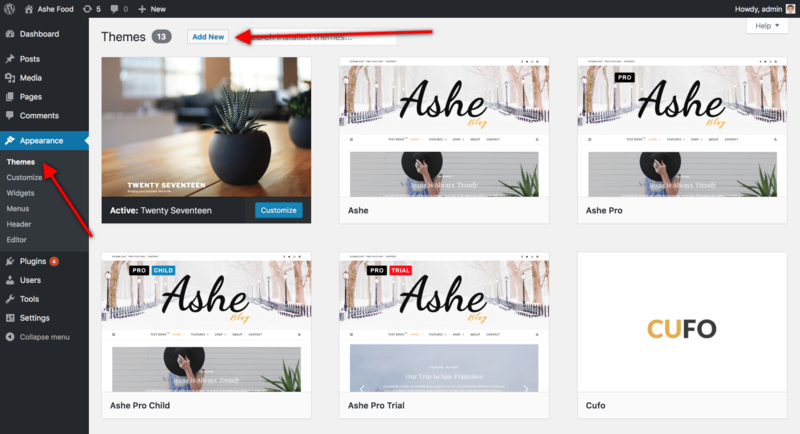 If you want to activate one of the Predefined Styles in the Ashe Pro theme, navigate to Appearance > About Ashe and click on Activate button on the style you want to apply. Don't forget that the changes you've made in the Theme Customizer before activation, will be lost. All the changes made in the Theme Customizer will be lost and overwritten by this Style. 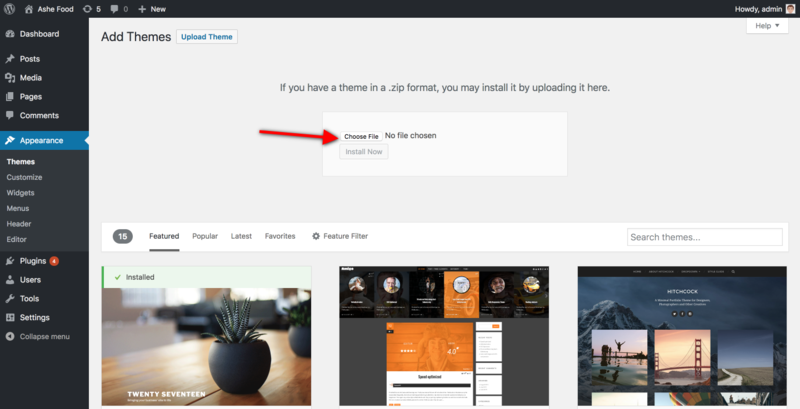 Please note, that this will only change settings in the Theme Customizer and will NOT affect your website content (pages, posts, menus, media, widgets, etc..). If you are activating one of these styles on the fresh installation of WordPress (i.e. you have no content yet) it's recommended to import the theme Demo Content. After Version 2.0 you need to enter a License Key in order to receive Automatic Theme Updates which includes Feature Updates, Security Updates and Bug Fixes. After purchase you will receive an email with the unique License Key which then could be used for the theme activation. If you have not received this email yet, click on Get My License Key button and enter your email address to resend it but don't forget to check the Spam folder. Note: If you have not received that email, please contact us and we will help you.